This is a Nico Nico presentation, but looks like it was shown in full. So we get pro-shot and no clipping. Win-win. This match is a Rookie of Stardom Semifinal Match. Just a mini-tournament, the Rookie of Stardom Tournament is all completed in one night and features four wrestlers. “Rookie” is a loose term in Stardom, but this year three of the four are in their first year of wrestling. Arisu Nanase debuted in May and is 15 years old, while Ruaka just debuted in November and is only 12 years old. They tie-up, Arisu gets Ruaka into the ropes and they take turns elbowing each other in the chest. Ruaka takes Arisu to the mat but Arisu gets a foot on the ropes, dropkick by Ruaka and they trade elbows again. Ruaka stomps on Arisu but Arisu avoids her charge in the corner and hits a dropkick. Jumping crossbody for Ruaka for two, she picks up Arisu but Arisu scoop slams her. Another scoop slam by Arisu and she puts Ruaka in a crab hold, but Ruaka gets a hand to the ropes. Arisu goes for another slam but Ruaka lands on top of her, running boot by Ruaka in the corner but Arisu delivers a dropkick. Another dropkick by Arisu and she puts Ruaka in a crab hold, and this time Ruaka submits! Arisu wins the match and reaches the Finals of the tournament. A really basic match, which is what you’d expect when a match has a 12 year old that debuted just a couple weeks prior. All things considered it was well-worked, not all the strikes looked strong but neither looked lost at any point. Not a bad match between two youngsters with very little experience. This match is a Rookie of Stardom Semifinal Match. While Azumi has a lot more experience than Natsuko, who just debuted in October, Natsuko has quite the age advantage. Natsuko is 25 years old, which obviously is quite old for a rookie, while Azumi is only 14 years old. So this is anyone’s game, as it pits age vs. experience to a lopsided degree. No-nonsense Azumi doesn’t shake Natsuko’s hand before the match, both wrestlers trade dropkick attempts before Azumi applies a few La Magistrals for two. Natsuko drives Azumi back into the corner but Azumi hits a dropkick, she goes for a scoop slam but Natsuko blocks it. Natsuko and Azumi trade elbows until Azumi hits a DDT, kick to the back by Azumi but Natsuko shoulderblocks her to the mat for a two count. Natsuko picks up Azumi and hits a scoop slam, she goes to run off the ropes but Azumi trips her and hits a dropkick. More dropkicks by Azumi and she elbows Natsuko in the chest, but Natsuko grabs her and hit a side Russian leg sweep. Natsuko applies an armtrap necklock but releases it after a moment, she goes off the ropes but Azumi avoids the senton and applies a crucifix pin for two. Tilt-a-whirl roll-up by Azumi for two, Natsuko goes off the ropes but Azumi kicks her in the stomach and they trade quick roll-ups. Azumi goes for La Magistral but Natsuko blocks it and holds down Azumi for the three count! Natsuko continues on in the tournament! Simple, but Natsuko already shows some promise. She has been training in Stardom since the beginning of the year and is 25, so it makes sense that she is quite capable of having short-ish matches without looking confused. Azumi wore a new outfit but still lost anyway, she is a great character but didn’t look like the better wrestler here even though she has a couple years experience. A fun little match between the young wrestler and the newbie. This is a Four Way Elimination Tag Team Match. Quite a unique assortment of wrestlers here. 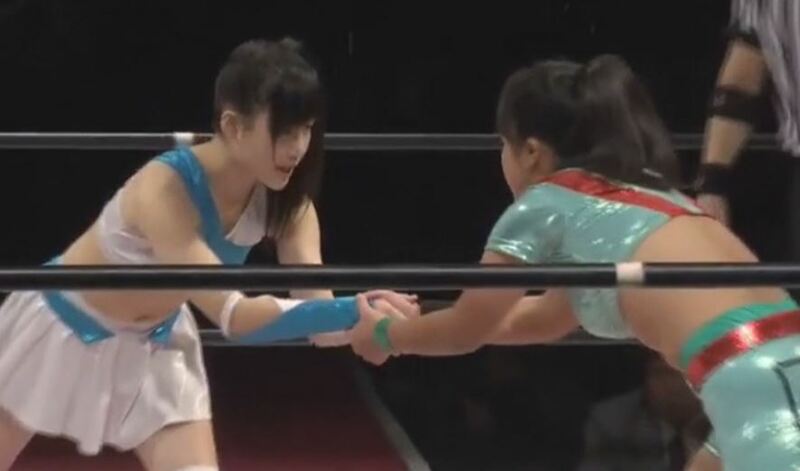 Yoneyama is teaming with the ‘rookie’ as she tends to do, one of the lower ranking ones as she hopes to help her get the first notable win in her career. Hana and Kris are from Oedo Tai, while Taya and Matsumoto are just a random pairing since this is Taya’s first tour with Stardom. Bito also has joined up with a young wrestler with less than two years experience, so the teams are mostly even with the possible edge to Matsumoto/Taya. As an Elimination Match, two teams are legal at a time and if one partner is pinned the team is eliminated. Bito and Yoneyama start the match, kicks by Bito but Yoneyama avoids the next few and rolls her up for two. 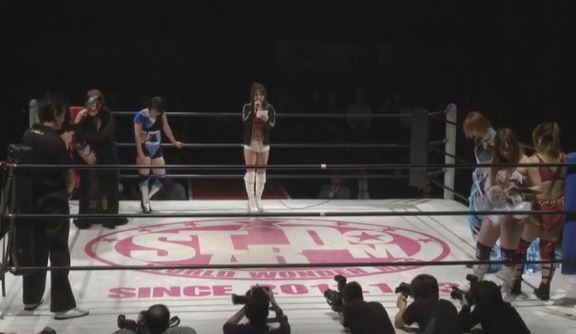 Saori and Hana are tagged in, Hana does a dance around the ring and challenges Saori to do the same. Saori does but Hana rolls her up from behind, Saori elbows Hana and the two trade blows. Lariat by Hana but Anou hits a hard shoulderblock, Hiromi attacks her from behind but Taya comes in too and they become the legal wrestlers. Taya asks for a knuckle lock even though the much smaller Hiromi can’t reach her, Yoneyama comes in and puts Hiromi on her shoulders to even the odds but Taya Irish whips them and pushes them over. Everyone else comes in as Hiroyo and Taya stack their opponents in the corner, cannonball by Taya and Hiroyo stays in with Hiromi. Hiroyo tries to throw Hiromi out of the ring but Hiromi slides out onto the apron. Hana dropkicks Hiroyo into Hiromi to knock her off the apron, elbows by Hana but Hiroyo elbows her to the mat. Hana gets up and hits more elbows but Hiroyo snapmares her and hits a double knee drop. Hana takes off her belt and chokes Hiroyo with it, running double knee by Hana in the corner and she hits a dropkick for two. Hana goes for a suplex but Hiroyo blocks it and hits a backbreaker, Kris runs in but she gets a backbreaker too. Hiroyo puts them both in a crab hold, Bito and Anou ‘help’ by pulling on Hiroyo’s hair, which leads to Hiroyo breaking the hold. Hiromi and Yoneyama run in and clear the ring, Taya gets on the apron and dives down on the whole bunch. Hiromi tries to do the same but she gets caught, until Yoneyama runs over and helps knock them over. Yoneyama rolls Kris into the ring and hits a diving senton off the second turnbuckle, but Kris gets a shoulder up. Hiromi goes for an assisted senton but Kris moves, big boot by Hana and Kris jackknifes Hiromi for the three count! Hiromi Mimura and Kaori Yoneyama are eliminated. Saori and Bito quickly run in and double team Kris, B-Driver by Bito and she covers Kris for three! Kris Wolf and Hana Kimura are eliminated. This leaves Taya/Hiroyo and Bito/Saori as the remaining teams. Hiroyo and Bito trade elbows, Saori hits Hiroyo from the apron which allows Bito to hit a big boot. Back bodydrop by Bito and she kicks Hiroyo in the back, more kicks by Bito but Hiroyo hits a body block followed by a big lariat. Taya comes in and jumps on Hiroyo’s back before hitting a double kneedrop. Reverse double kneedrop by Hiroyo out of the corner to Bito, but Saori runs in and breaks up the cover. Taya jumps on Hiroyo’s back again and they do a double kneedrop on Saori, Taya throws Saori into the corner and she hits a back elbow. Lariat by Taya but Saori avoids her charge in the corner. Dropkick by Taya, Hiroyo comes back in but so does Bito and she hits a double lariat. Bito kicks Taya in the head, Saori covers her with a bridge but the pin is broken up. Hiroyo lariats Bito, double knee strike by Taya to Saori and she hits a Northern Lights Suplex. Taya bridges out of the suplex and hits a double footstomp, cover by Taya and she gets the three count! Taya and Hiroyo Matsumoto are the winners! This is the Rookie of Stardom Final. Arisu and Natsuko lock knuckles, Natsuko pushes Arisu down but Arisu pops back up. Pancake by Arisu but Natsuko stomps on her, snapmare by Natsuko and she kicks Arisu in the back. Natsuko puts Arisu in a camel clutch, she throws her into the corner and she delivers a dropkick. Natsuko charges Arisu but Arisu flips away and puts Natsuko in an cross-ankle submission hold. Arisu then applies a crab hold, Natsuko gets out of it but Arisu scoop slams her to the mat. They trade mounted elbows, rolling necklock by Natsuko but Arisu gets a foot on the ropes. Natsuko picks up Arisu and knocks her to the mat, hard elbow by Natsuko but Arisu retires fire. Hard shoulderblock by Natsuko, she picks up Arisu but Arisu fights her off and applies a backslide for two. Dropkick by Arisu but Natsuko chokes her, side Russian leg sweep by Natsuko and she covers Arisu for a two count. Senton by Natsuko, she goes off the ropes and hits another running senton but Arisu reverses the cover to one of her own. Natsuko stomps on Arisu and picks her up, she slams Arisu in front of the corner but Arisu avoids the diving senton attempt. Running dropkicks by Arisu and she hits a double wrist-clutch suplex, Blockbuster by Arisu and she gets the three count! Arisu Nanase wins the Rookie of Stardom Tournament! A solid ending to the mini-tournament. It may say a lot that Arisu won the tournament (or it could mean nothing and they will all be in the opener for the next year regardless). Arisu is already showing some attitude, the only thing holding her back at this point is her age as Stardom isn’t going to push her by so hard until she is at least 16. But both showed here they are well trained and prepared rookies as both stayed on target and focused without any miscommunications. Stardom builds up wrestlers slow so it may be awhile until either move too far up the card, but it was a fun rookie match. This match is for the Goddesses of Stardom Championship. 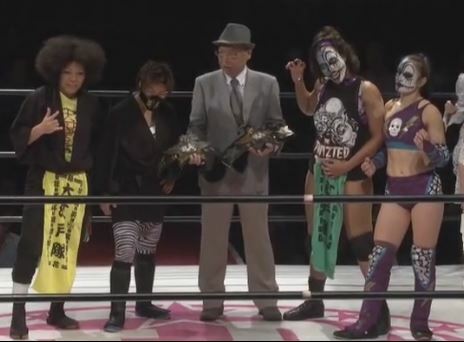 Kyoko and Kagetsu won the tag titles on June 16th, this is only their second defense of the title however as the belts are a bit of an afterthought since Oedo Tai usually wrestles as a faction. Thunder Rosa and Holidead have been teaming since they both came back to Stardom in October. They had a few notable wins leading up to this match to justify their title challenge, including beating Kyona/Mayu and Hiromi/Kairi. The Twisted Sisters are technically in Oedo Tai, however since they don’t wrestle in Stardom often, they don’t have the bond that the other members have together so its safe to assume Hana and Kris will help Kyoko and Kagetsu if needed. Kagetsu starts with Rosa and actually shakes her hand beforehand. See, they are friends. They bounce off the ropes and Rosa hits a spinning headscissors, Kagetsu falls out of the ring but she quickly rolls back in when Rosa goes out after her. They tag out, Holidead and Kyoko lock knuckles but Kyoko pokes Holidead in the eyes and hits a shoulderblock. Holidead returns the favor with her own shoulderblock before tagging in Rosa, Kyoko is back up by now and the two trade chops. Rosa goes for a springboard move but Kyoko sidesteps it and tags Kagetsu, Kagetsu elbows Rosa in the head and hits a scoop slam for two. Headlock by Kagetsu, she picks up Rosa and clubs on her until she tags Kyoko back in. Kyoko puts Rosa in a Figure Four but Rosa gets into the ropes, Kagetsu is tagged in and she continues the work on Rosa. Rosa flings Kagetsu to the mat with a hurricanrana and makes the hot tag to Holidead, Kyoko comes in too however and she blows in Holidead’s face. Holidead lariats both of her opponents but Kagetsu comes back with a missile dropkick, Samoan Drop by Holidead and she tags in Rosa, Rosa elbows Kagetsu but Kagetsu returns with elbows of her own. Hard dropkicks by Rosa and she hits a STO for a two count cover. Rosa kicks Kagetsu in the back but Kagetsu retorts with a kick to the head, and both wrestlers crawl to their corners to tag out. Big boot by Holidead but Kyoko blocks the second attempt and kicks Holidead in the leg. Kick to the head by Kyoko, Kagetsu comes in and they both boot Holidead for a two count. Kyoko picks up Holidead and puts her in a stretch hold, but Holidead muscles out of it and hits an Air Raid Crash. Kyoko goes off the ropes but Holidead hits a sit-down spinebuster, picking up a two. Kyoko is thrown a briefcase but Holidead pushes it away and Rosa hits both Kyoko and Kagetsu with it. Double underhook facebuster by Holidead, diving footstomp by Rosa and Holidead hits a diving legdrop but Kagetsu breaks up the cover. Kris Wolf jumps on the apron and hits Holidead in the head, Holidead goes for a chokeslam but Kyoko rolls her up for the three count! Kyoko Kimura and Kagetsu retain the championship. I can’t say that I loved this match. The wrestlers are all fine and all have had quality matches in the last month in Stardom, but something didn’t mesh here. Time may have been an issue but they struggled to tell a story to get the audience into it as it went from trading spots to brief leg work to “Oedo Tai” finish without anything to tie it together. Both teams are heels so the hot tag wasn’t too hot, and it didn’t have the excitement you’d hope from an Oedo Tai match or a title match. It was technically sound but just felt flat, not one of the better Kyoko and Kagetsu matches I have seen in Stardom recently. We have reached the main event of the evening. In my last review, we saw young Momo turn on her friends and join with Io Shirai, as they formed a new faction called Queen’s Quest. Which is a perfectly fine faction name. Course in doing so she turned on her tag team partner in that match, Mayu Iwatani, plus her partner for the last few months, Jungle Kyona. So this is your typical revenge type match as Momo has to face off against her old friends while Mayu gets another shot at her former partner Io Shirai. They start with a brawl and immediately go outside the ring, Kyona and Kairi return with Io but Io quickly turns the tables and dispatches both of them. Mayu comes in but the rest of Queen’s Quest also comes in and all three triple team Mayu. Momo kicks down Mayu in the corner as Queen’s Quest takes turns on poor Mayu as they tag in and out, but Mayu eventually hits a missile dropkick on Momo and makes the hot tag to Kyona. Kyona shoulderblocks Momo before knocking both Io and HZK off the apron, she goes back to Momo but Momo dropkicks her. Another hard shoulderblock by Kyona, she picks up Momo but Io and HZK both run in to help. Kyona is thrown in the corner but Kyona gets away and hits a crossbody on all three of them. Kyona hits more shoulderblocks on Momo but Momo fires back with kicks, elbows by Kyona but Momo slaps her. Running boot by Momo, Kairi tags in and goes up top, hitting a diving elbow smash. She grabs some water and splashes Kyona with it to fire her up, Mayu comes in too and Momo is knocked over with a catapult dropkick. Kairi picks up Momo but Momo floats over her back with a sunset flip. Dropkick by Momo and she tags HZK, chop to the chest by HZK and she applies an armtrap crossface to Kairi. Kairi gets a foot on the ropes to force the break, HZK picks her up and elbows Kairi in the ropes. Kairi switches positions with her and returns the favor, HZK slides out to the apron and snaps Kairi’s neck on the top rope. Raideen Drop by HZK off the second rope, she picks up Kairi but Kairi hits a spear. Punch to the gut by HZK but Kairi hits a double chop to the chest for a two count. Both wrestlers tag out as Io and Mayu come in, elbows by Mayu but Io trips her and hits a slingshot dropkick from the apron. Io kicks at Mayu’s head, Mayu goes for a springboard move but stops herself on the ropes as Io had moved out of the way. When Io turns around, Mayu then springboards off with a dropkick and follows up with another dropkick while Io is against the ropes. Cover by Mayu, but it gets a two count. Kairi and Kyona come in and go for the catapult dropkick, but Io dropkicks Mayu and palm strikes both her teammates. Running double knee by Io in the corner, HZK comes in and kicks Mayu in the head before Momo connects with the avalanche Somato. Io goes for a moonsault, Mayu moves but Io lands on her feet and hits a palm strike. Package German by Io, but Mayu gets a shoulder up. Io picks up Mayu but Kyona grabs Mayu from the apron to help, Kairi comes in too but Io throws Kairi into both of them. German Suplex by Io to Mayu, but it only gets a two count. Io goes towards the turnbuckle but Mayu grabs her foot, stomps by Io and she goes up top anyway but Kyouna clubs her leg out from under her. Io lands in the Tree of Woe, diving footstomp by Kairi and now it is Mayu that goes up top. Diving Footstomp by Mayu, but Io kicks out of the pin. Superkick by Mayu and she applies a crucifix pin, but Momo breaks it up. Kyona lariats Momo and HZK, they knock Io into the corner and this time connect with the catapult dropkick. Mayu goes for the dragon suplex, Io blocks it and rolls up Mayu, but Mayu reverses the roll-up and applies a cradle of her own for the three count! Mayu, Momo, and Kairi win! The biggest compliment I can give a smaller Stardom event is that nothing on the show was below average. The rookie tournament was fun, sure you aren’t going to get any five star matches out of a bunch of children and new wrestlers but all three matches were worked well and all four wrestlers had a bit of a chance in the spotlight. I liked the big four tag team match, not long enough but entertaining from start to finish. The only match that was a disappointment was the tag team championship match, it just came across as not important and with Oedo Tai battling each other it had a weird dynamic that never really worked. The main event was the Io show, as most Stardom main events are, but Mayu did her part well and Kyona/Momo continued their personal conflict. Overall a solid show, worth the casual watch for sure.